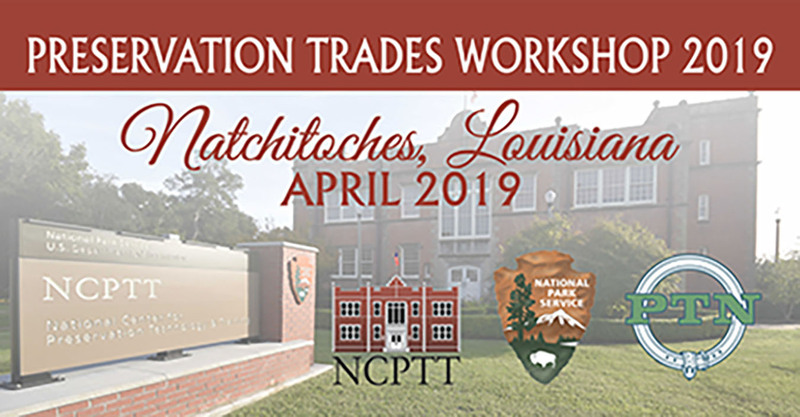 PTN is partnering with the National Park Service’s National Center for Preservation Technology and Training to hold a Preservation Trades Workshop in Natchitoches, Louisiana on April 26-27, 2019. We are looking for demonstrators and vendors to make this event a success in a region we have not visited in close to a decade. Natchitoches is the oldest European settlement in Louisiana and has abundant resources for participants to visit and learn about. We are working with locals to share their knowledge of local historic building materials such as bousillage, which is a Spanish moss and clay/dirt mixture that is used for wall construction. Demonstrating at a PTN event is a great opportunity to share your knowledge and skills of traditional trades with architects, site managers, historic home owners, and other trades people! Demonstrator's receive a free pass for themselves and up to one assistance to the event; a pass for the vendors and demonstrators reception; and a one year membership to PTN. If you are interested in demonstrating please fill out this form by March 15, 2019. These events would not be a success without the support of our vendors and sponsors. There are many different levels in which you can support the event and connect with people working on historic buildings and sites. Applications for Misia Leonard Scholarship are available online. The scholarship supports qualifying students, apprentices, and young professionals to cover expenses for attending the annual PTN events. Registration will be coming soon! For more information or questions please contact info@ptn.org.